DOUGLAS — Anthropologists and history buffs were thrilled Monday to have found behind Pershing Magnet School the leftovers from a Confederate soldier’s dinner and a license plate that fell off a horse. Researchers from DePaul University and members of the Camp Douglas Restoration Foundation were out Monday where the Civil War prisoner camp Camp Douglas stood more than 150 years ago searching for artifacts for a museum about the prison. “No one in Chicago even knows about it, even now,” said Phil Grinstead, a member of the foundation who was out helping on the dig. 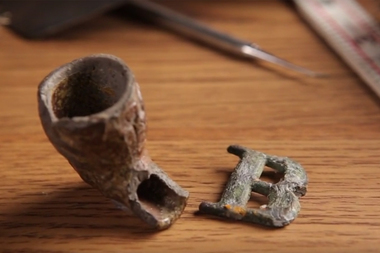 But the Civil War-era camp still has some secrets lurking nearly two feet below the grass in parts of Douglas. 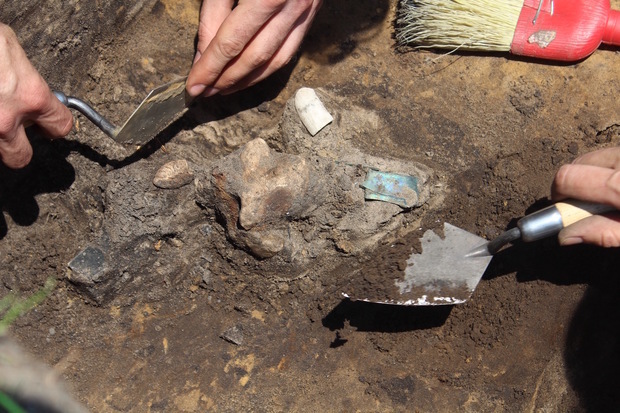 Since excavation started Wednesday, Michael Gregory, an anthropology professor from DePaul University, and his team have found buttons off of a Union Soldier’s jacket, clay pipes and ink bottles leftover from the camp. Along the way they’ve also found more recent artifacts of the neighborhood that was built on top of the camp, including a license plate that would have hung around a horse’s neck from 1908 and fragments of jewelry and buttons. Gregory said most of the historical sites of the camp have been destroyed when basements were dug for homes or is now paved over or on private land, like where the cemetery for small pox victims from the camp once was and which is now the parking lot for the Lake Meadows Shopping Center. Last year’s excavations turned up clay pipes carved by prisoners into the image of demons and devils and crews are hoping to find more this year. Crews will be out at Pershing school until Wednesday looking for more Civil War-era bullets, bobbles from uniforms and leftovers from dinner, like the beef bones already found that show the marks where the butcher’s saw cut up the portions. During the Civil War, 31,000 Confederate soldiers went through Camp Douglas, with nearly 6,000 dying of small pox and diseases from malnutrition at the 60-acre prison complex, which is where Lake Meadows Apartments, Martin Luther King Drive and Pershing school now stand. The group is hoping to start a museum about the camp in the Douglas community to serve as a physical reminder of the camp and is applying for a spot on the National Register of Historic Places to commemorate the spot. The group is preparing its application for the national register now and hopes to have a museum open about the camp in the next 10 years.